As Sidney Crosby readies himself for his return tonight, the watching world readies itself for the next hit. Such is now the reality of Crosby’s career. Any hit, knock, or bump to the head could force him from the game. We simply await the one that will force him from the game for good. Picture Bobby Orr. We all know the scene well; it hangs from so many living room walls. There he is, black and white, soaring through the air, Number Four: a man in the prime of his career and the prime of his life. In that moment, Orr is everything we strive toward. He is joyful, youthful, and successful. Even children growing up immersed in the Wayne Gretzky era learned of Bobby Orr. They were made aware of how he moved across the rink, how he ragged the puck, effortlessly dancing around the ice as if to savour the moment. Clearly he belonged in a higher hockey league. Because his career was halted before it was supposed to expire, Number Four continues to play on in the imagination of hockey fans. The memory of Orr exists in mythical proportions. Like Bobby Orr before him, Sidney Crosby may face the possibility of early retirement. Just as in the case of Orr, we all may have to cope with losing hockey’s top talent in the prime of his career. The prospect of life without Sidney is not new to hockey fans. The unspeakable scenario has loomed over this past year of uncertainty in which Crosby has played only eight games. Is this really how it’s going to be? The greatest player of his generation, yo-yoing in and out of the lineup until, finally, it ends? Imagine Crosby as a veteran. He’s in his late thirties; he can finally grow a proper moustache. Difficult to imagine, isn’t it? And, no, not just the moustache bit. It’s obvious that Crosby is increasingly susceptible to future concussions. Chances are he won’t still be playing in his late thirties. At some point he will get hit for the last time. Bobby Orr’s last great season was 1974-75 in which he scored 135 points and was a plus-80. For the next four years he made only cameo appearances on the ice and skipped altogether the 1977- 78 season. Orr played in only 36 games those last four years. Is Crosby condemned to follow the same path as Orr? Maybe not. However, for what does history exist if not instruction? The Orr tragedy serves as a warning for those of us awaiting Crosby’s return tonight. There is no certainty in this. “Losing Bobby was the greatest blow the National Hockey League has ever suffered,” remarked Gordie Howe after Orr was forced into retirement at the age of 30 because of repeated injuries to his left knee. Orr’s departure, like a death in the family, left a cavity that could not be filled. Because his career ended prematurely, Orr is not remembered by his full body of work. No, the bad knee is mostly shunned from memory and the Chicago years are considered a strange dream. Instead, Orr is fiercely remembered by what should have been. Like a rock star who dies young, the void left by his early retirement brings into sharper focus the brilliance of his healthy seasons. Contrast the aura that surrounds the Orr years with the more simple appreciation of the Wayne Gretzky era. 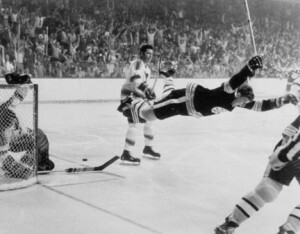 Recall the iconic image of Orr: The Goal, May 10, 1970 – flying, a superman on skates. What has become Gretzky’s iconic image? Surely it is the Madison Square Garden goodbye. Waving to the crowd, crying, the blue New York Rangers shirt tucked into his pants on the right side. Gretzky’s goodbye was proper. He retired at the age of 38 when hockey players are supposed to retire. Unlike Orr, Gretzky’s career ran its full course. We may be fated to remember Crosby in the same way we remember Orr. At the age of 23, it was evident that Sidney Crosby had emerged as the premier player of his generation. He averaged 1.61 points per game during the first half of the 2010-11 season before missing the rest of the year. Extrapolated to a full season his points total would have been 132, the highest since 1995-96, when only Crosby’s Pittsburgh ancestors, Mario Lemieux and Jaromir Jagr, recorded more. Furthermore, from Nov. 5 to Dec. 28, 2010, a span of 25 contests, Crosby recorded at least a point in every game. The Penguins won 19 times and Crosby totalled 50 points. Four days after the streak ended came the fateful New Year’s Day concussion. As dramatically as Crosby had entered his prime, he exited it, seemingly temporarily, but perhaps forever. Recall the contrast between the iconic images of Orr and Gretzky: one soaring, the other waving goodbye. What will Crosby’s iconic image be? Perhaps he will be remembered by that afternoon in Vancouver, the rising crowd behind him, gloves slung from his hands, his jubilant screaming face turned toward the wash of red and white teammates coming his way. Crosby will be remembered by his glory, like Orr, because the farewell won’t fit. It doesn’t appear as though a tearful goodbye lap around the ice is going to happen. When he comes back tonight be sure to enjoy him. Appreciate his talent. Watch how he takes a pass and bursts through the neutral zone, head up, scanning. Marvel at his ability to control play along the boards. Watch how he threads the puck to teammates through a web of sticks and skates. Notice his child-like joy when his team scores. Watch now because we don’t know when he’ll have to leave for the last time. Crosby’s departure may be several games or several years away. It will be abrupt. It will feel wrong. Until then, watch as often as you can.